The Kyocera Verve manual or user guide is available online (PDF). 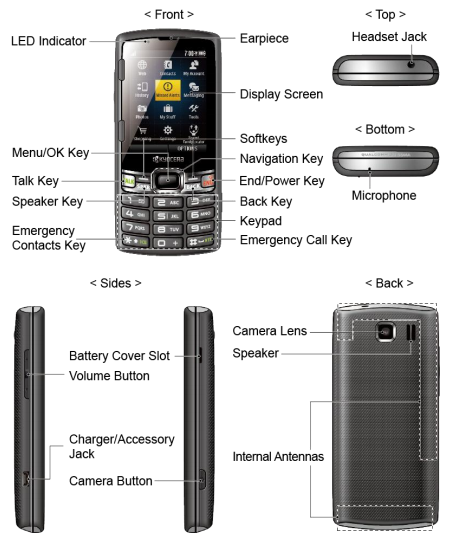 The user guide has been published by kyoceramobile.com. This phone is available Sprint Network and Boost Mobile carrier. It comes with 2.4 inches TFT screen display with a resolution of 240 x 320. This phone equipped with 256 MB of RAM, 512 MB of internal memory. The Kyocera Verve equipped with 2 megapixel main camera with digital zoom. In addition also powered by Li-Ion 1100 mAH battery capacity with standby time up to 261 hours and and talk time up to 16 hours. The Kyocera Verve user manual is consisting of 110 pages with file size of 1.28 MB. It's available in english language. The manual provide detail reference information such as phone glance, setting up phone, set up email, learn phone basic operations, Install the battery, make phone calls, using contacts, call settings, using messages, using apps, download games, ringtones, using web, using internet, using camera for taking pcitures, using bluetooth, update phone, phone settings guide like security settings, lock phone, reset phone, and more.